The Blue Mound Memorial Library has had some changes to the staff recently. 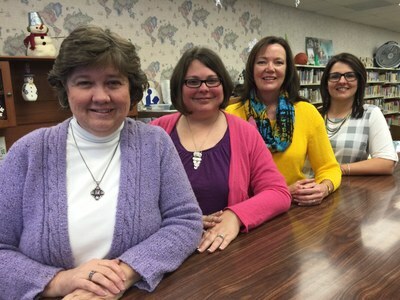 Starting from left to right, we would like to welcome our new Library Director, Julie Jones. Julie is has been a Blue Mound resident for the past 30+ years. She recently retired from the public school system, after 35 years of teaching 7 and 8 grade math courses. She and her husband Tom have 4 children and one grandson. We are happy to have her with us. Erin Ireland has been with the library for over a year. She is also a resident of rural Boody. She and her husband, David, have three children. When she is not working at the library she loves to read and is very active with her family and Church. This Decatur native, is a graduate of Eisenhower High School, and attended Richland Community College. Monica Reynolds, is a resident of Blue Mound, and has lived in this area most all of her life. She has worked for the library for the past 9-10 years in different capacities. She is a graduate of Blue Mound High School and attended Richland Community College. She also enjoys reading, being with her family and helping with her grandchildren. We have been glad to have her over the years to help with our Library!!! Lindsey Sheppard is the newest member of our Library staff. She started working at the library at the first of the year. She graduated from the University of Illinois. She and her husband live in rural Boody with their two children. In her spare time she loves to read and cheer on the Chicago Cubs. We are glad to have her with our staff!!! Alice Reed (on left) has been a been a part of the Blue Mound Library for the past 17 years. She has been the Assistant Librarian, the Librarian, and is currently the Library's Bookkeeper. She has lived in Blue Mound for most of her life. She graduated from Blue Mound High School and is a graduate of both Richland and Millikin University. She holds a Bachelors in Early Childhood Development. She and her husband Jeff have two sons. 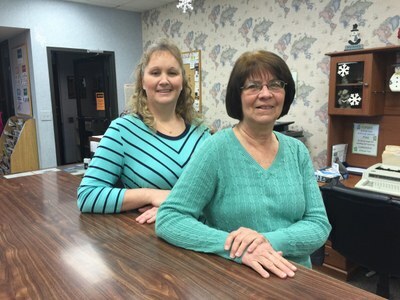 Carolyn Wetzel, (on right) has been a part of the Blue Mound Library Staff for the past 7 years as the Custodian. When she isn't working here at the Library, she is serving breakfast and lunch at the Meridian Elementary School. She has four girls who all graduated from Blue Mound High School. Carolyn has been a resident of Blue Mound most all of her life. We are glad to have her!! The Blue Mound Memorial Public Library provides free services to all residents living within the Blue Mound Library district, with services available to all others for a fee. Our friendly and professional staff is eager to serve you. Welcome to the Blue Mound Public Library!